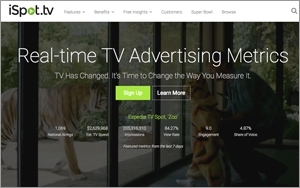 Expanding its efforts to measure traditional TV commercial activity, TV advertising researcher iSpot.tv will offer more details about specific TV advertising performance, as well as "view" rates. The company -- which has tracked the activity of TV ads in real-time, offering media revenue estimates among other data -- is now adding new metrics. That includes impressions and non-duplicated reach for all ads across live national/local TV, time-shifted platforms, video-on-demand and over-the-top digital TV platforms. It says research from connected smart TVs protects consumer privacy, and collects data passively and at scale. New research will also include “view” rates. ‘View’ rates for TV commercials will measure -- based on Interactive Advertising Bureau (IAB) digital video standards -- the number of starts, completions and parts of commercials viewed, generating average view rates for a single advertisement, brand, or industry. It will also take into account channel switching, fast-forwarding and other behaviors. For example, during the fourth quarter, 73% of automotive ads were viewed from 75% of the ad to its completion. During this period, there was an 18% “view” rate in viewing a commercial to its “midway” point. iSpot.tv uses proprietary technology embedded into TV sets that can detect show content and commercials in iSpot.tv’s commercial catalog. Using proprietary fingerprinting technologies, ads can be tracked on the TV set and can identify what is being viewed on each screen. For its media revenue projections -- part of its existing research package -- iSpot.tv has used data from SQAD to obtain spending estimates. SQAD provides iSpot.tv with average advertising insertion costs across all networks. Recording linear broadcasts from 113 networks in multiple locations around the country, iSpot.tv tags over 40 different dimensions of metadata, including brand, agency, actors, products, songs, moods, URLs and other data. 1 comment about "iSpot.TV Provides New Metrics To Track Ads In Real-Time". Ed Papazian from Media Dynamics Inc, January 25, 2016 at 5:32 p.m.
As for the metrics, while I always welcome useful data about viewer response to commercials, what we are talking about is time on-screen not "viewing". There's a correlation, of course, but certainly not a perfect match.